Trisha says: I was sitting here at my in-laws in the wee morning hours of Christmas. Everyone else in the house had already gone to bed. I was listening to Christmas carols and doing my nails and decided I didn’t want to have more caffeine. So the natural alternative is a cocktail, right? 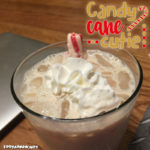 Enjoy my quick original concoction, the Candy Cane Cutie. Stir with the peppermint stick or candy cane and leave for 2-3 minutes for the candy to dissolve a bit. Stir again. Top with a dollop of whipped cream (optional) & enjoy!